...exquisite long-stemmed roses capture the pure white color of airy fresh cloud. Their soft, velvety petals are delicately layered to blossom in a perfect display of nature's beauty. Adorn your home or send as an elegant gift this "Wonderful white roses" bouquet to someone special whatever the occasion, these majestic blooms are sure to grace the surroundings of any environment. Our florists decorate this beautiful bouquet with roses one by one. The floral shop and all-Ukraine courier delivery service since 1999. 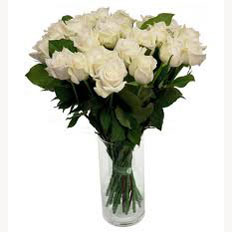 Order Wonderful white roses today. We'll deliver it on weekdays, weekends, holidays or any special dates. Send joy to someone special tomorrow. Free sweets or a greeting card for every order of $100 or more.